Honey and the blossoms from which it made. Photo courtesy National Honey Board. CAPSULE REPORT: If you’re confused about the different types of honey, here’s the place to get a thorough grounding. Then, return to the main honey page to add to your knowledge. This is Page 1 of a four-page article. Click on the black links below to visit other pages. If you’re a honey lover who has only tried one type of honey in your life—most likely, the plain liquid variety—you’re missing out on a buffet table of golden beauties. Pure honey is available in different forms to compliment food and beverages (read our article on pairing food and honey), or simply to enjoy like candy. 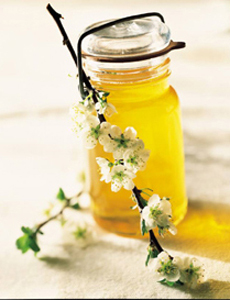 Honey is defined as a sweet and viscous fluid produced by honeybees and other insects from the nectar of flowers. It is a mixture of sugars; 70% to 80% of honey is largely fructose and sucrose, with some maltose, melezitose and sucrose. The rest is water, minerals and traces of protein, acids, and other substances.The specific composition of any batch of honey will depend largely on the flowers consumed by the bees that produced the honey. Honey is significantly sweeter than table sugar. According to the United States National Honey Board and other nations’ food regulations, the definition of honey stipulates a pure product that does not allow for the addition of any other substance, e.g. water or other sweeteners. Bees other than honeybees (the genus Apis) produce honey, but it has very different properties. Crystallized or granulated refers to the transformation of the liquid honey unto hard crystals. This happens in varieties of honey that have a higher proportion of glucose to fructose (this is referred to by some people as “hardening”). In scientific terms, honey is a supersaturated solution because it is composed of so much more sugar (more than 70%) relative to the water content (often less than 20%). The sugars are largely glucose and fructose. The glucose tends to precipitate out of the solution; honey varieties that are high in glucose will crystallize readily; honeys that are high in fructose will not. Crystallized honey can be reliquified by applying heat (30 seconds in a microwave or 10 to 15 minutes in a pan of hot water). Some varietals, like raspberry honey, have such glucose content that they crystallize immediately upon removal from the comb. Such honeys can only be offered in cremed form, a finely crystallized, spreadable state. (In other varietals, crystallization can be deliberately induced to make the cremed form.) Controlled crystallization results in a product with a smooth, spreadable consistency; spontaneous crystallization results in a coarse and grainy product. The flavor of honey is affected by its terroir (tur-WAHR), the unique combination of geographic location, climate and microclimate, soil and temperature that gives the flower nectar a complex composition and the honey made from it an individual personality. As in the growing of grapes for wine or beans for coffee, terroir dramatically affects the flavor profiles of the product produced. Supermarket honeys tend to be blends of cheap honey from all over the world, pasteurized to achieve a “typical” consistency and shelf life. Artisan honey is a much finer product, made by beekeepers who harvest it, using traditional, labor-intensive methods that preserve the integrity of the honey. Honey definitions © National Honey Board. Additional material © Copyright Lifestyle Direct, Inc. Images are copyright of their respective owners.